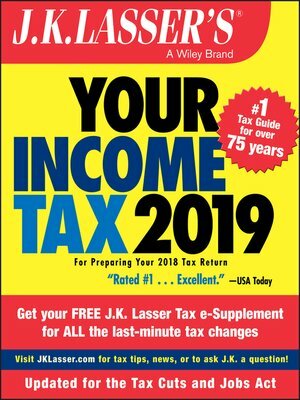 J.K. Lasser's Your Income Tax 2019 is the nation's most trusted tax guide, updated to help you prepare your 2018 return. Step-by-step expert guidance walks you through the forms, calculations, and deadlines to help you file your taxes without the headaches. New changes including tax laws, IRS rulings, court decisions, and more are explained in plain English, backed by examples of how they apply to individual taxpayers like yourself. Explore your options in terms of deductions, income shelters, and planning strategies to maximize your savings and keep more of your money—without wading through volumes of dense tax code. This comprehensive yet accessible guide is your handbook for making your tax filing for 2018 easier than you thought possible.